Home / B.J. Ward / Comic Con / Retro Con / Retro Con 2018 / TV / B.J. Ward Replaces Melendy Britt at Retro Con 2018! B.J. 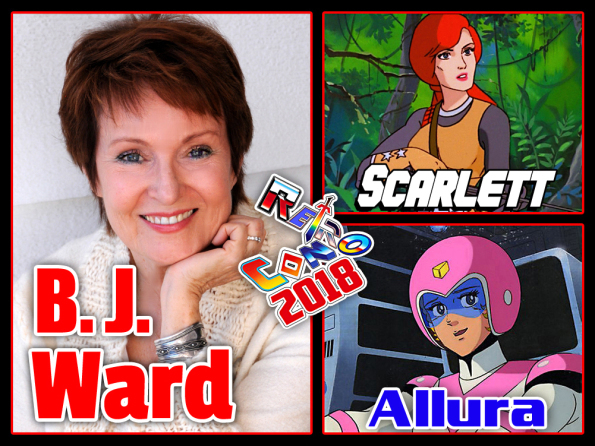 Ward Replaces Melendy Britt at Retro Con 2018! Retro Con 2018 is almost here! Unfortunately, Melendy Britt suffered an injury and will not be able to attend this year's show. However, a replacement guest has been announced...B.J. Ward! The voice of Scarlett in G.I. Joe: A Real American Hero and Princess Alura (and Witch Hagar) in the original Voltron animated series will be making a rare convention appearance in Britt's stead. You have heard B.J. as Wonder Woman in the The Super Powers Team: Galactic Guardians series, Small Foot on Challenge of the GoBots, Sincia on Saber Rider & the Star Sheriffs, Betty Rubble in various Flintstones productions from the '80s to the early 2000’s, several characters on the original My Little Pony series, and also as brainy Velma Dinkley in several Scooby Doo animated movies from the late '90s and early '00s!